The Fellowship was fortunate enough to obtain a copy of DUSK from Dusk Comics. The story is written by David Doub with pencils by Maki Naro, Jerry Gonzales and Franc Czuba; inks by Jerry Gonzales and Chris Scott. 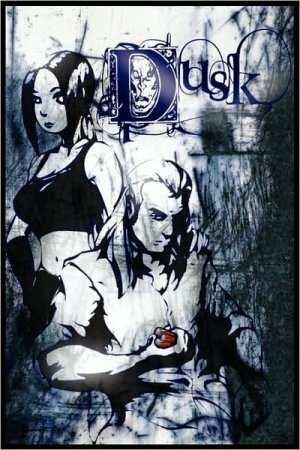 DUSK contains four short stories revolving around a vampire named Ash and his human assistant Eve. The first story sees Eve going after a vampire who does realize he is one. The second story focuses on Eve’s past life and introduces Ash’s other assistant Nicholas. The third story has Eve reluctantly joining forces with mercenary Felix Klein to take down vampire Frederic Neckar in the mountains of Italy. The final story has Eve dealing with Teddy, a ridiculed high school boy who decides to get even – with The Unspoken Vengeance spell. The art for the most part is good. Franc Czuba did the art on the final story and it’s the best of the four. However Maki Naro, who did the first two stories, showed flashes of brilliance in some pages. These stories are well written with a little action, horror and a lot of emotion. What I find intriguing is the relationship between Ash and Eve. Ash wants her to leave him and have a normal life, but she wants to stay in this dark, somber and violent world. At times Ash is more human than Eve. I definitely would like to read more about these characters, especially Ash. DUSK is available at www.amazon.com or at www.duskcomics.com.